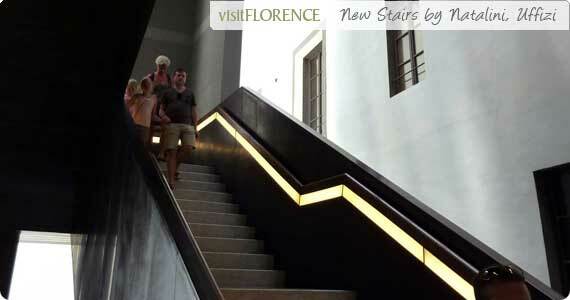 Blog / Florence / Discovering the Uffizi Gallery! 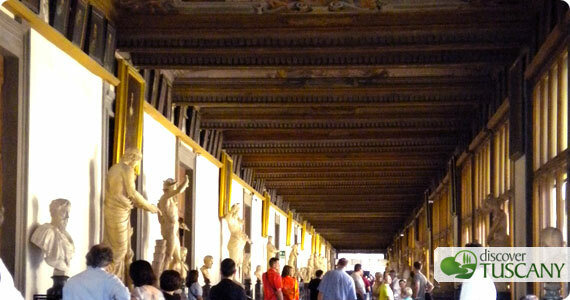 Last week we visited one of the most beautiful museum in the world: the Uffizi Gallery in Florence. Since the museum hosts a very important quantity of artworks we decided to take a guide to deepen the history of the museum and to discover something new about Florence. Actually we didn’t want to miss any of the main masterpieces within the museum! The Uffizi can easily become a labyrinth if you don’t know where to go and what to see. Of course a labyrinth in which one gladly get lost! Our tour began at the ground floor, when the guide pointed out the portrait of Anna Maria, the last member of the Medici family, who made a special stipulation to keep the Medici’s art collection in Florence. Then we climbed up to the second floor and we arrived at the Lorraine Atrium, here we saw a series of marble busts dedicated to the members of the Medici Family and its successors: the Lorraine. Before entering the rooms dedicated to the main artists, we stopped admiring the ceiling of the Eastern Corridor and its splendid grotesque decorations. We only stopped to admire the incredible panorama enjoyable from the Terrace over The Loggia dei Lanzi which is located at the end of the Western Corridor. From the bar we went down to the first floor using the new staircase designed by the architect Natalini and we had a quick look at the new rooms the Red ones and the Blue ones. Then, we stopped to visit the last rooms, in particular the one hosting the works of Caravaggio and the other one dedicated to Paolo Uccello, where you can admire his splendid Battle of San Romano which marks the end of the museum. 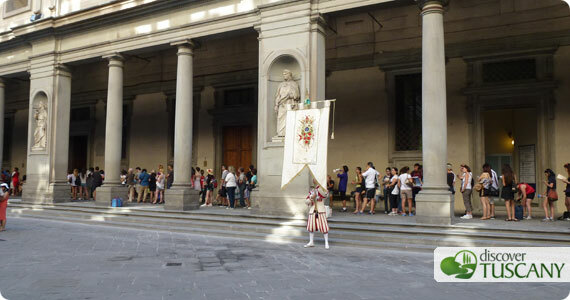 Avoid the long lines at the entrance to the Uffizi, buy the tickets in advance and enjoy your tour! Social media addicted, keen on travels, in love with my land, Tuscany. Sara has decided to share all the emotions this region can offer through her posts on our blog. Special Openings, Guided tour, Free Entry: Summer at the Academy Gallery!